Paca the Frog’s life changed the day she watched TV for the first time. It was a rock concert and Paca was fascinated - not by the music, but by the singers’ long hair. -Oh! What long and pretty hair. I want something like that, something that shows that I’m special. But Paca was only a frog. 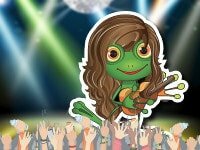 She hadn’t been to school and didn’t even know that frogs don’t have hair, so she thought that her hair would grow if she gave concerts. Her croak didn’t work with rock music, opera or pop, but she carried on performing everywhere she went. She went to towns and cities, to the sea and mountains, into streets and gardens… until one day she gave a concert in a hairdresser’s. While Paca was singing, without anyone knowing that there was a frog there, the hairdresser was cutting a customer’s hair. A large piece fell onto Paca’s head, and, seeing herself with so much hair, she thought that her dream was finally coming true. In her excitement, she sang with such strength and enthusiasm that she woke up Fredo, the hairdresser’s cat. Seeing the pile of moving hair, the cat pounced on it and gobbled it up, mistaking it for a mouse. Paca wasn’t saved by her long hair or by her musical style. Being a frog saved her, because Fredo didn’t like the cold touch and slippery feel of her skin and he spat her out. However, the reminders of the attack stayed forever, marked with large scars on Paca’s skin, as well as in her memory. So, in that way she learned that being a frog also had its good side. From that moment on, Paca studied all the advantages of being a frog and the best way to use them. She started a school for frogs, where she produced the most talented and happiest frogs. Note: story translated by Luke Botcherby, Rainford High Technology College, Merseyside (England). This translation was the winner of the Spanish A-Level Translation Competition for schools organized by the Spanish Section of the Department of Languages, Information and Communications at Manchester Metropolitan University. Congratulations, Luke! Paca is so obbsessed with her appearance that risked her like. Does the mere appearance worth it? What kind of things would worth to take such a risk? Have you ever been so worried about something that you payed to it more attention than you should? What were the outcomes of such an obsession? Let's try to take advantage of those things we don't like and can't be modified. Maybe you don't like your tall, look, strength, speed... whatever. You can buy a hollow doll with the appearance of a frog and dress it up as a rock star. Everyone will choose a personal quality he or she don't like, and when is able to use it in positive way, will write it down and throw the paper in the frog. When the frog is full, you can take some good time reading all those ways to use your qualities in a positive way. I'm sure you will throw a party to celebrate them!